This round medium grain rice is probably Italy`s finest. Carnaroli rice keeps its shape better than other forms of rice during the slow cooking required for making risotto due to higher quantities of amylose present within. It is often described as being a “superfino” rice o as “the king of rices”. Ideal for the more delicate recipe. Since 1996, products bearing the prestigious European mark I.G.P. 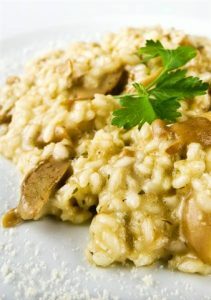 (Protected Denomination of Origin), have included Nano Vialone Veronese Rice. This excellent rice is the product of a land, culture and typical Italian tradition for living and eating well.